The Assistant Minister for Cities and Digital Transformation in Australia, the Hon. Angus Taylor MP, released the National Cities Performance Framework Interim Report on 20 July 2017. Public feedback is being sought till August 18, 2017. The Framework is intended to support the Australian Government&apos;s Smart Cities Plan, by enabling the measurement of the performance of Australia&apos;s largest cities. The framework is expected to be completed by late 2017. It will bring together critical data, making information accessible in one online location, in the form of an indicator dashboard supported by the DTA (Digital Transformation Agency). It will provide people with baseline information about their city across a range of social, economic and environmental indicators. The Performance Framework will enable all governments to better target, monitor and evaluate cities policy. It will be key to the Government&apos;s commitment to continuous improvement through City Deals. The proposed framework uses 12 contextual indicators and 40 performance indicators. Contextual indicators are expected to help understand why a city performs the way it does and what policies may be effective for improving economic performance and quality of life. For example, the Performance Framework includes the labour force participation rate as a performance indicator, to help understand residents’ workforce engagement. However, some smaller cities have older populations, which may partly explain their lower labour force participation. The National Cities Performance Framework contains 12 contextual indicators. They include measures on characteristics like housing tenure profile (outright, mortgaged or rented), population and population growth rate, Dependency ratio (the ratio of working aged population to its non-working aged population) and median household income. They are not measures of performance and typically not amenable to local policy intervention. But they provide the context for understanding what policies might be effective in different cities. These indicators will facilitate evidence-based policy making, alerting policy makers to potential issues and providing a starting point for considering different policy options. The selected indicators were picked on the basis of relevance, completeness, data availability, comparability, measurability, reliability, familiarity and non-redundancy. Some indicators can provide insight into multiple policy priorities due to overlaps. For example, the ‘liveability and sustainability’ policy priority has many links to the ‘housing’, ‘jobs and skills’ and other priorities. The Performance Framework will be a living resource that will expand and improve over time. Future updates will draw on resources made available through the Australian Government’s open data initiatives, including data.gov.au and NationalMap. A formal review scheduled for 2019–20, will refine its content, improve its presentation and increase its functionality. Possible future directions include international benchmarking, the addition of new cities and sub-city information, and annual reports on key trends. 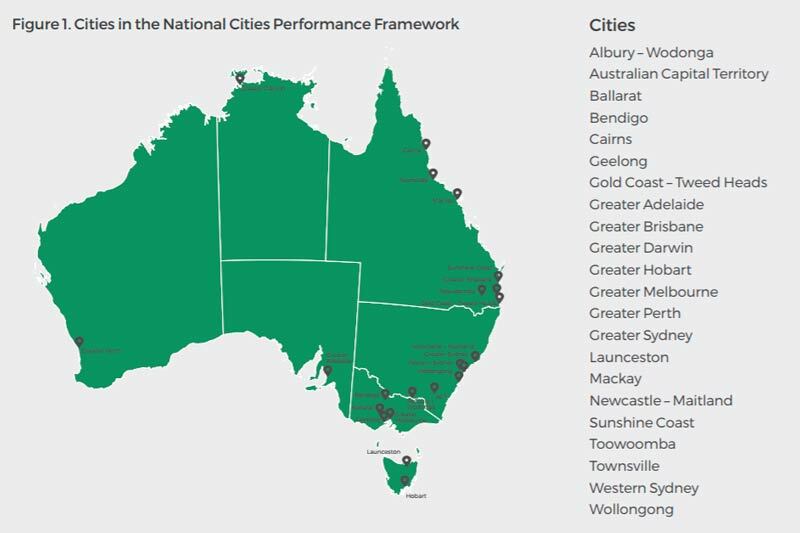 Access the National Cities Performance Framework Interim Report here/ Feedback can be provided using the online feedback form available here.